I always thought I can get by with my Hindi in Nepal. Nepal, though a small country, is culturally rich and Nepali is very different from Hindi. I can understand few words here and there when people speak Nepali. People do respond to me when the interaction is limited to buying things or asking for directions. People involved with commerce know Hindi more than other people. My interaction is with farmers and septic tank cleaners. They don’t seem to give a damn about Hindi as my interaction is about my research related to water and sanitation. Knowing local language not only helps me with my research, it helps me connect better with local people! I am sure any human being will appreciate the effort one puts into learning a local language! Also, Nepal is a country I will keep visiting my entire life! The country and its people are simply wonderful! I was listening to David Sedaris’ book “Let’s Explore Diabetes With Owls” where the author talks about his travel experiences and mentions Pimsleur, Michel Thomas, and Lonely Planet phrasebook. He makes an excellent point – these days we don’t even give a second thought to the fact that English is not an universal language. We expect people to speak English everywhere, which I would like to call it as linguistic oppression! When people of the new country do put in an effort to communicate in a language which we know, we rarely complement them by saying “Your English / Hindi is good”! 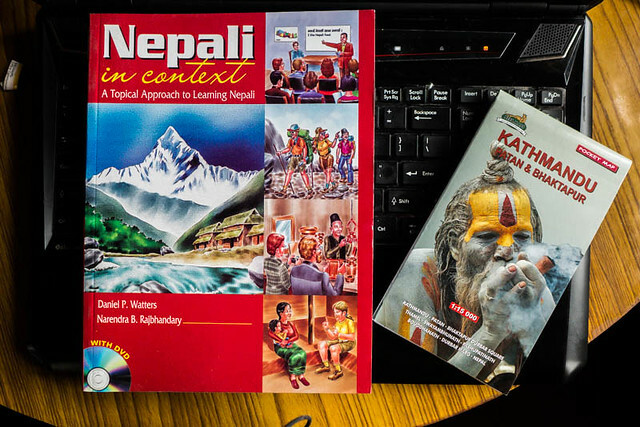 It is time for me to start a new venture – Learn Nepali! Yes, after my fugacious affairs with German, French, and Spanish, it is time for me to pick up a bit of Nepali. Nepali script is same as Hindi and Sanskrit i.e. Devnagari. There are many common words shared between Hindi and Nepali. I am hoping that Nepali will not be as difficult to pick up! Learn Nepal and roam around Kathmandu! I went to Saraswati book Center (north of Pulchowk, west of Krishna Galli) and picked up the above book “Nepali in context, a topical approach to learning Nepali”. Nepal has very good maps. Since it is a country whose economy is very much aided by tourists, the options for maps is numerous! I just decided to start with a pocket map of Kathmandu, Patan and Bhaktapur. Though there were several options, I decided to go with this “Sadhu smoking Ganja” version! There are many Nepali radio channels to help me hone my language further! The adventure is about to begin! Stay tuned!